Instax Square collage. Camera: Fujifilm Instax SQ6, using double exposure and coloured flash covers. Sometime last year, I bought a Fujifilm Instax Mini camera, the Neo 90 Classic. Although the camera in itself comes with a number of seductive features (double exposure, timer…), the small, if not to say tiny, size of the photos made me look upon the camera as not much more than a gimmick. As such, I used it for taking snapshots and souvenirs. I did take it with me to Brighton earlier this year, however, and as I quite like some of the resulting shots, I decided to post them. A couple of years ago, Impossible Project, the makers of polaroid-compatible instant film, began producing a device they call the Instant Lab, which allows you to transfer digital images from a smartphone or tablet to instant film prints. Some call the device a printer, but Impossible Project calls it a camera, and I tend to agree with the latter. Now, Impossible Project are not the only ones manufacturing these type of devices, there exist similar ones by Fujifilm and Lomography which produce prints using Fujifilm Instax Mini film. The success of these devices (as well as on demand print books etc. ), and the increasing demand for instant film cameras overall, obviously points to a demand for a return to tangible, physical images; not as a replacement of but existing alongside the possibilities which the digital age has to offer in terms of capturing and presenting photos. As interesting as that may be, I am more intrigued by another facet of this: the continuous blurring of the lines between analog and digital. Analog photos obviously also exist in the digital sphere, they are scanned (from a negative or a positive) then presented and shared online. The physical copy of the image may not even exist beyond the negative. When scanning analog photos, the results are sometimes digitally manipulated, and even if not, the very act of scanning oftentimes alters the image. Additionally, viewing a photo on a backlit screen is a very different experience from viewing a print. In other words, photos shot on analog equipment already lead a hermaphrodite type of existence. 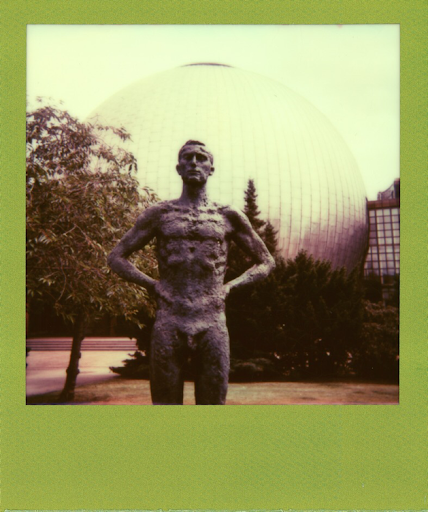 Now the Instant Lab actually keeps blurring the distinction even more. Transferring a digital image to the instant film is not a copy/paste process, the result is never a 1:1 transfer. Depending on the film used, or the exposure time, or a number of other variables, the result is different in one way or another from the original. You can even do double exposures. Like any camera, you need to get the hang of it to produce optimum results. And of course, all that happens after you manipulate a photo on the smartphone, sometimes more, sometimes less so. And finally, of course, you scan the physical picture and the process has come full circle. I have been using the Instant Lab since 2013, and presented a good number of results on my site. I have now put together a set that showcases all the portrait and street photography images that I put through the Instant Lab. The set includes straight transfers of iPhone photos to instant film, but it also includes double exposures done with the instant lab as well as copies of manipulations I did with the pics and the iPhone. It even includes an image I created when I accidentally cracked the screen of my iPhone. The interesting aspect is that the device allows for a different range of images than is possible with standard Polaroid cameras. Besides the aforementioned image manipulations, this includes photos taken in situations for which the Polaroid cameras are not well suited for, interiors (if you don’t like flash) or street photography (Polaroid cameras tend to be a bit too obvious for discrete shots) for example. Some results are due to accidents: my instant lab has recently developed a flaw, damaging the exposure. 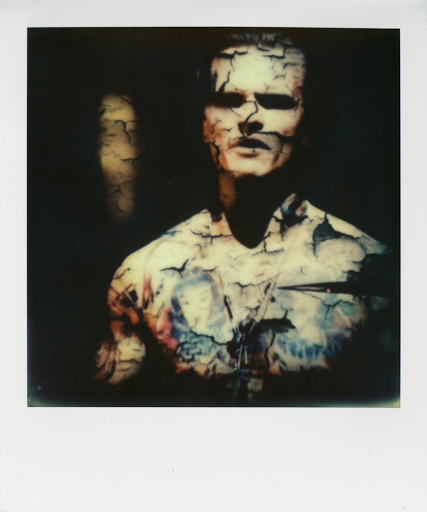 Strangely enough, the damage often works in favour of the image, somehow accentuating the subject in the photo (Impossible Project has offered to replace the device, I should add). 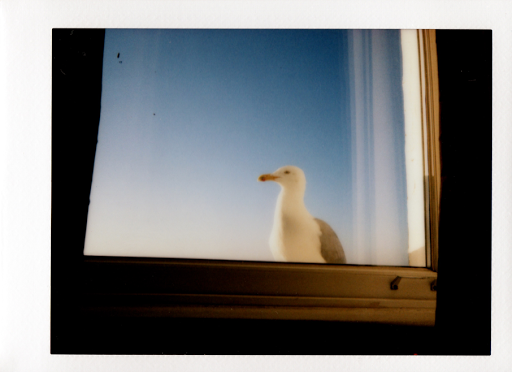 Last year I published a set of instant photos entitled Fragments: Signs of the Times, which I just updated with a selection of photos taken throughout 2014. Fragments is a collection of images depicting public art, graffiti, posters and other symbols (both permanent and temporary) which epitomise Berlin at a certain instant in time. The permanent structures tend to reflect much of Berlin’s late 20th century history, especially its division, as they symbolise, and sometimes directly address, the tastes, affiliations and beliefs typical of West and East Berlin respectively – not just pre- but also post-fall-of-the-wall. The more temporary displays – graffiti, posters etc. – on the other hand reflect moods, tastes and opinions of the moment in time when the pictures were taken – current then, but history a couple of weeks, months, years down the line. All the photos except one were taken with Polaroid cameras and a variety of Impossible Project films, both colour and black and white. Urban Geometry is the title of a new set which I’ve recently added to the Polaroid section of the site. In it, I explore the geometry found in modern architecture and urban development. 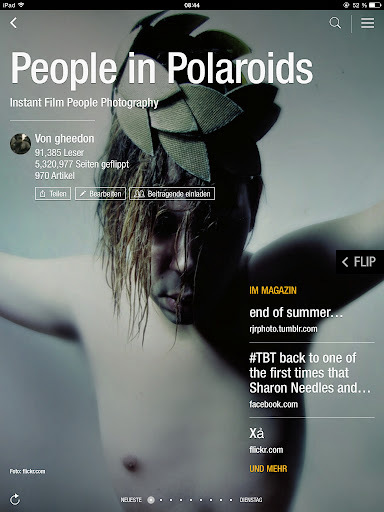 I shot these images chiefly in Berlin over the course of 2014. This past October I returned to India for what was my tenth trip to that country. While revisiting familiar places, I also spend time in a corner of India which I haven’t been to before, namely Odisha, or Orissa as it was formerly called. This western state lays claim to some of the oldest temples in all of India, if not the world – temples up to 2000 years old; but for all that, it is not really a tourist destination – at least not a place where western tourists flock to. As such I saw but three westerners during my stay in Bhubaneswar, and while Puri and its beaches attract a number of backpackers, they are vastly outnumbered by the Indian tourists and pilgrims. Puri is home to the large 12th century Jaganath temple, one of India’s four holy pilgrim sites. Bhubaneswar is home to a range of temples, some of them dating back to BC, including the imposing Lingaraj temple with its 54m high tower. Other holy places nearby are the caves at Khandagiri and Udayagiri, hewn out of the rock by Jain priests in the second century BC, and a more recent Buddhist pagoda in Dhauri, honouring the warrior-king turned pacifist Buddhist, Ashoka. The largest temple in the vicinity is the Sun Temple in Kornarak, dating back to the 13th century. last two trips to India. Rajasthan boasts glamorous palaces and colourful cities which Odisha doesn’t have. Odisha certainly has magnificent landscapes, but in the end, to me as an outsider at least, the region seems to be very much about the holy places, and thus about religion and spirituality. Obviously, India is by nature a very spiritual country, or should I say, Indians are a very spiritual people. Not all, of course, but many, even those who are not outright religious, consider themselves to be spiritual. This is reflected in their outlook, their customs big and small, their food, their adornments (which are never just adornments but always symbols of something), and not to mention the many religious festivals held throughout the year. Odisha, with its high concentration of temples and pilgrims, and it’s lack of worldly attractions, seems very much like an epicenter of this spirituality; and indeed, there was not a single person from Orissa who I met who didn’t, by word or by deed, displayed their affinity towards, or veneration of, all things religious and spiritual. Religion is not something I generally think highly of. I believe it is at the root of most evil perpetrated in the world, as it constitutes the greatest single cause of hatred and intolerance; and certainly India had and still has its fair share of strife caused by religious intolerance. Yet it is very hard not to be charmed by the outlook on life which rises out of the beliefs of many of the Indians whom I met over the years. For starters, their attitude is generally a very inclusive one, at least with regard to visitors (whether or not the same tolerance that is granted outsiders is shown to members of one’s own family or close friends is a different discussion). It’s also very life affirming and optimistic. And it even produces effects that you wouldn’t normally think – such as the fact (as some people claim) that the preponderant veneration of the goddess Kali in the city Kolkata leads to women in Kolkata being generally more empowered than in other parts of India. This makes India a good place to visit as the people you meet are open and welcoming, tolerant of one’s quirks and differences, curious in a good way and ready to become friends. I’ve stated this in previous posts, but to me, visiting India is more about meeting people than it is about seeing great sights. And this time, even more than on previous visits, that fact is reflected in the photos I took. Yes, I also photographed temples and other sights and aspects, but 90% of the photos I took are portraits. Indians in general are happy to be photographed, all you need is ask. I asked pilgrims and priests, families on the beach, passers-by on the street. Sometimes, I didn’t even need to ask as some, mainly youngsters, happily volunteered. The result is an eclectic mix of people from all walks of life. 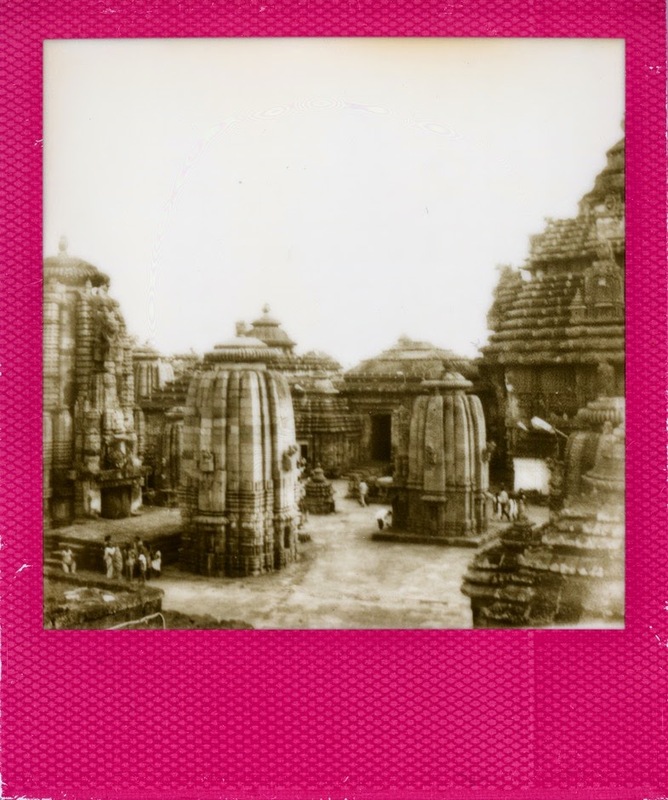 On the last two visits to India I had chiefly taken colour polaroid films with me, but each time I was unhappy with the resulting exposures as most of them were discoloured – whether by the heat or by the airport x-ray machines, I don’t know, but I found the resulting red discolouration more than just a bit distracting (see my earlier post here). Thus, this time around, I packed but one colour film and seven black and white films, including Impossible Project’s new Pigeonhole film with its round border, which I found perfect for portrait photography. This decision paid off as I came back with many more worthwhile polaroids than I did on previous trips. 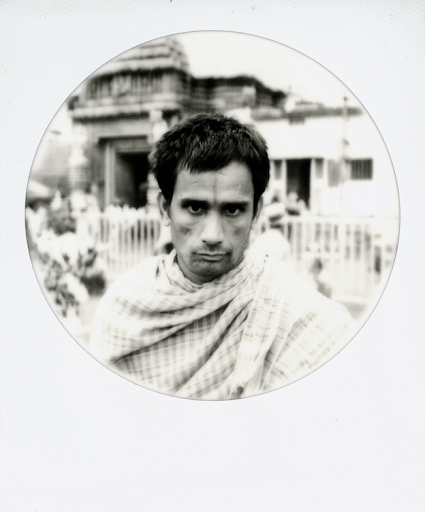 I put together a selection of the best instant photographs, focusing on the portraits, under the title: I Wonder If I Know Him Now: Faces of India 2014. I have yet to develop a series of Holga films which will follow later, which, together with a selection of digital photos, will focus on other aspects of the visit. Coming to an end with my death. In the sight and touch of my beloved? On the shores of the shining sea. This ‘I’ is not imprisoned within my bounds. Beyond the borders of time and space. In the voice of the poet. From the dark clouds pour the rains. Of countless births and deaths. The ‘I’ that reaches everywhere. These past months I’ve been heavily shooting black and white instant films. One of my favourite films has turned out to be Impossible Project’s new ‘Hard Color’ film with its solid colour frames and stark contrasts, a combination I really like; but I’ve also been using that other favourite film of my, the black framed one. 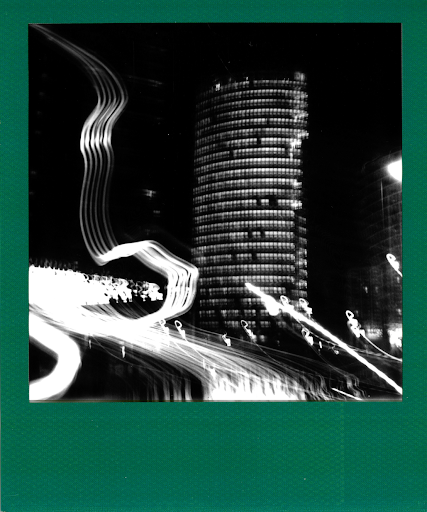 I’ve put together the best of the urban-themed photos which I shot around Berlin in a new set entitled ‘City Polaroids: Berlin in Black & White’ [Click here to view]. I’ve always loved black and white photography for its seemingly time-bending quality, that is, the fact that it couples memories of old classic photos with contemporary realities such as (post-)modern architecture and contemporary urban scenes. Or alternatively, how it evokes a sense of a lost past when photographing historic places or old buildings, a theme I explored in an earlier set, Another Time [read the blog entry here]. 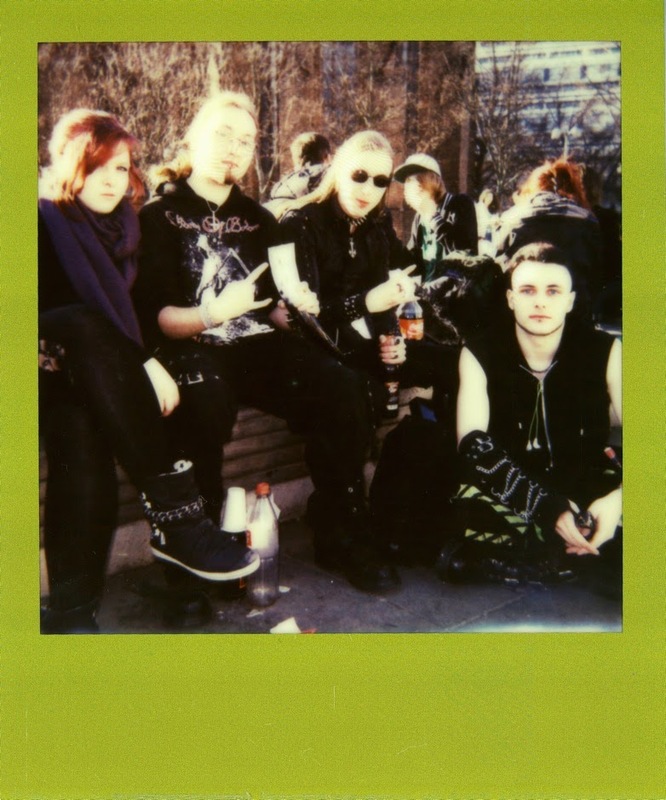 I’ve uploaded a new set of portraits taken with Polaroid cameras. The set also includes several shots produced with Impossible Project’s Instant Lab camera, from original shots taken with the iPhone. The photos date from last summer until now. Most were taken in Berlin, but there are also a few from India and a couple of other places. For more people photographs, click here. 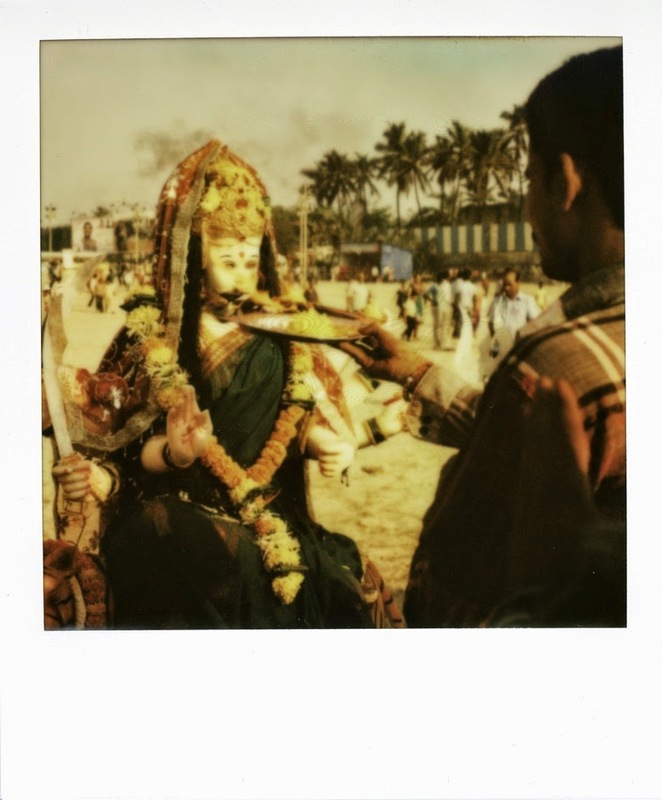 For more instant film photographs, click here. 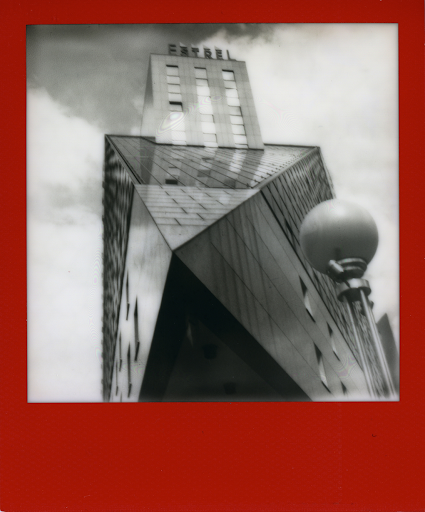 For more info on the Instant Lab camera, click here to view the Impossible Project site. As you might have guessed from previous postings, I like to photograph buildings. Often, I find a building at it’s most fascinating when, on sunny days, it becomes clear how the architecture plays with light, be it in the way it reflects light, breaks it, or lets it through. When lines and shapes are enhanced by light and by shadows. 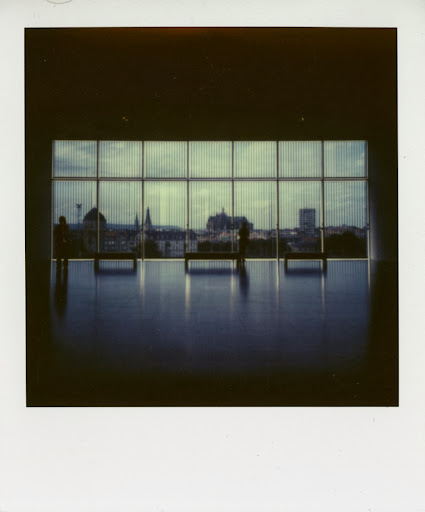 I just put up a new Polaroid set which reflects this, Lines and Light. The photographs were taken in Berlin, in Metz, France (some in the Centre Pompidou), and a couple in London.